Liczba stron: 4109 Jest to ujednolicona liczba stron, która ułatwi Ci porównanie długości książek. Każda strona Legimi to 200 słów. The King James Version (KJV), also known as the Authorized Version (AV) or King James Bible (KJB), is an English translation of the Christian Bible for the Church of England that began in 1604 and was completed in 1611. First printed by the King's Printer Robert Barker, this was the third translation into English to be approved by the English Church authorities. The first was the Great Bible commissioned in the reign of King Henry VIII (1535), and the second was the Bishops' Bible of 1568. In January 1604, James I convened the Hampton Court Conference where a new English version was conceived in response to the perceived problems of the earlier translations as detected by the Puritans, a faction within the Church of England. The translation is widely considered a towering achievement in English literature, as both beautiful and scholarly. James gave the translators instructions intended to guarantee that the new version would conform to the ecclesiology and reflect the episcopal structure of the Church of England and its belief in an ordained clergy. The translation was done by 47 scholars, all of whom were members of the Church of England. In common with most other translations of the period, the New Testament was translated from Greek, the Old Testament was translated from Hebrew and Aramaic text, while the Apocrypha was translated from the Greek and Latin. In the Book of Common Prayer (1662), the text of the Authorized Version replaced the text of the Great Bible – for Epistle and Gospel readings (but not for the Psalter which has retained substantially Coverdale's Great Bible version) and as such was authorized by Act of Parliament. By the first half of the 18th century, the Authorized Version had become effectively unchallenged as the English translation used in Anglican and English Protestant churches, other than for the Psalms and some short passages in the Book of Common Prayer of the Church of England. Over the course of the 18th century, the Authorized Version supplanted the Latin Vulgate as the standard version of scripture for English-speaking scholars. With the development of stereotype printing at the beginning of the 19th century, this version of The Bible became the most widely printed book in history, almost all such printings presenting the standard text of 1769 extensively re-edited by Benjamin Blayney at Oxford; and nearly always omitting the books of the Apocrypha. 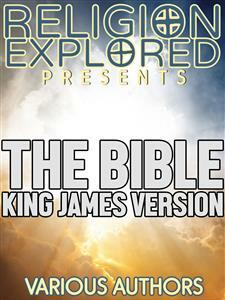 Today the unqualified title 'King James Version' commonly identifies this Oxford standard text. 4:9 And the LORD said unto Cain, Where is Abel thy brother? And he said, I know not: Am I my brother’s keeper? 4:10 And he said, What hast thou done? the voice of thy brother’s blood crieth unto me from the ground. 4:11 And now art thou cursed from the earth, which hath opened her mouth to receive thy brother’s blood from thy hand; 4:12 When thou tillest the ground, it shall not henceforth yield unto thee her strength; a fugitive and a vagabond shalt thou be in the earth. 7:13 In the selfsame day entered Noah, and Shem, and Ham, and Japheth, the sons of Noah, and Noah’s wife, and the three wives of his sons with them, into the ark; 7:14 They, and every beast after his kind, and all the cattle after their kind, and every creeping thing that creepeth upon the earth after his kind, and every fowl after his kind, every bird of every sort. 8:15 And God spake unto Noah, saying, 8:16 Go forth of the ark, thou, and thy wife, and thy sons, and thy sons’ wives with thee. 8:18 And Noah went forth, and his sons, and his wife, and his sons’ wives with him: 8:19 Every beast, every creeping thing, and every fowl, and whatsoever creepeth upon the earth, after their kinds, went forth out of the ark. 10:25 And unto Eber were born two sons: the name of one was Peleg; for in his days was the earth divided; and his brother’s name was Joktan. 11:10 These are the generations of Shem: Shem was an hundred years old, and begat Arphaxad two years after the flood: 11:11 And Shem lived after he begat Arphaxad five hundred years, and begat sons and daughters. 11:12 And Arphaxad lived five and thirty years, and begat Salah: 11:13 And Arphaxad lived after he begat Salah four hundred and three years, and begat sons and daughters. 11:14 And Salah lived thirty years, and begat Eber: 11:15 And Salah lived after he begat Eber four hundred and three years, and begat sons and daughters. 11:16 And Eber lived four and thirty years, and begat Peleg: 11:17 And Eber lived after he begat Peleg four hundred and thirty years, and begat sons and daughters. 11:18 And Peleg lived thirty years, and begat Reu: 11:19 And Peleg lived after he begat Reu two hundred and nine years, and begat sons and daughters. 11:20 And Reu lived two and thirty years, and begat Serug: 11:21 And Reu lived after he begat Serug two hundred and seven years, and begat sons and daughters. 11:22 And Serug lived thirty years, and begat Nahor: 11:23 And Serug lived after he begat Nahor two hundred years, and begat sons and daughters. 11:24 And Nahor lived nine and twenty years, and begat Terah: 11:25 And Nahor lived after he begat Terah an hundred and nineteen years, and begat sons and daughters. 12:1 Now the LORD had said unto Abram, Get thee out of thy country, and from thy kindred, and from thy father’s house, unto a land that I will shew thee: 12:2 And I will make of thee a great nation, and I will bless thee, and make thy name great; and thou shalt be a blessing: 12:3 And I will bless them that bless thee, and curse him that curseth thee: and in thee shall all families of the earth be blessed. 14:22 And Abram said to the king of Sodom, I have lift up mine hand unto the LORD, the most high God, the possessor of heaven and earth, 14:23 That I will not take from a thread even to a shoelatchet, and that I will not take any thing that is thine, lest thou shouldest say, I have made Abram rich: 14:24 Save only that which the young men have eaten, and the portion of the men which went with me, Aner, Eshcol, and Mamre; let them take their portion. 15:13 And he said unto Abram, Know of a surety that thy seed shall be a stranger in a land that is not their’s, and shall serve them; and they shall afflict them four hundred years; 15:14 And also that nation, whom they shall serve, will I judge: and afterward shall they come out with great substance. 16:1 Now Sarai Abram’s wife bare him no children: and she had an handmaid, an Egyptian, whose name was Hagar. 16:8 And he said, Hagar, Sarai’s maid, whence camest thou? and whither wilt thou go? And she said, I flee from the face of my mistress Sarai.